This map is a re-engraving of a small oval map dating from 1590 by Jodocus Hondius. This map is dated c.1600 and was published in Cologne. 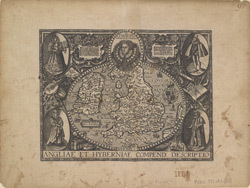 It differs from Hondius’s earlier map in that its decorative features are reversed and the title now appears along the lower border. The decorative elements are dominant. Surmounting the oval shaped map is a portrait of Queen Elizabeth I. She is flanked by text plaques on each side which contain biblical text praising the Queen and text hailing the prosperity of the realm. Contemporary costumed figures of an English nobleman and a citizen of London and their respective wives are displayed in opposite corners. Also included in the decorative scheme are symbolic compositions representing War (swords, spear, arrows) Art (musical instruments including a lute, viola, bagpipes) Industry (a chest and a sack of coins) and Husbandry (two sheep, a grain field and a bale of cloth). Hondius’s name is retained and the name of Peter Overadt, a publisher active in Cologne, and Conrad Goltz, the engraver. The outline of the England and Wales follows that of Saxton, with Ireland being a crude version of Ortelius’s outline. Only a small section of Scotland is shown.